NOTE: These pages deal with the Philosophy and Metaphysics of Mathematics and the Mathematical treatment of the Wave Structure of Matter (WSM). The theoretical physic pages (Quantum Theory, Einstein's Relativity and Cosmology) are treated separately. What is Mathematics and how can it Exist in the Universe. What is Mathematics and how can it Exist in the Universe? Given the Wave Structure of Matter in Space it is now possible to explain what mathematics is, how it can exist in the universe, and thus why it is so well suited for describing physical quantities (mathematical physics). i) Contain discrete / finite quantities (that can thus be counted / numbered). ii) These discrete things must be necessarily connected to one another (so they interact in a logical manner). The Wave Structure of Matter confirms this. Logic comes from the necessary interconnection and behavior of the spherical in out wave motions of Space, which is determined by the properties of Space (existing as a wave medium). In particular, waves form into complex wave patterns that interact logically / necessarily, and which are represented by our larger scale patterns that we call numbers. Quantities include the wavelength, velocity, frequency and amplitude of the waves, their energy, and the number of wave center 'particles' that exist in Space. And now, thanks to some great wave machine technology you can actually see how waves can form patterns / numbers. Thus you can see for yourselves how mathematical logic can exist in the universe due to the logical interconnection of wave patterns. 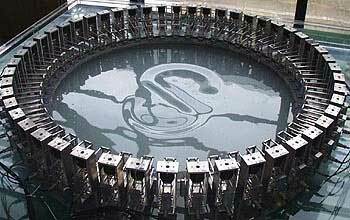 The device, called AMOEBA (Advanced Multiple Organized Experimental Basin), consists of 50 water wave generators encircling a cylindrical tank 1.6 meters in diameter and 30 cm deep. AMOEBA is capable of spelling out the entire roman alphabet. Each letter or picture remains on the water surface only for a moment, but they can be produced in succession on the surface every 3 seconds. The relationship between mathematics and music (vibrations / sound waves) is also well known, and in hindsight it is obvious that mathematics, maths physics, music (sound waves) and musical instruments exist because matter is a wave structure of Space. This is why all matter vibrates and has a resonant frequency. Mathematics may be considered as a logical relationship language developed upon the concept / definition of one. From this one, we can logically define two, three, etc. which we call numbers. Hence a number is some relationship to one. Once we have whole numbers then we can define add, subtract, multiply and divide. Fractions, squares, cubes, etc, all became possible, as more and more complexly defined relationships between numbers evolved. If we consider life on earth one billion years ago, humans did not exist. Thus mathematics existence must be found by considering the evolution of the human brain and mind. Why has the brain evolved such that it is able to develop and understand mathematics, which then allows a mathematical 'description' of Nature? The answer is found by considering our evolution. The mind can be considered as a relationship machine which has evolved to understand the logical consistency of the world about us and hence relate things in a systematic and logical manner. e.g. Once eating poison fruit was related with dying, then this relationship remained true and consistent. In this way a logical mind is a natural evolutionary consequence of the logical universe (as it enhances our survival). This is why mathematicians now seem so skeptical of Metaphysics as they use their mathematics to connect things instead. But mathematics does not exist in some magical realm - it exists in physical reality and depends upon it for its necessary connection. We now know this causal connection - matter is a spherical wave structure where the wave center 'particle' is in continual two way communication with all other matter in the observable universe due to its spherical in and out waves. So one substance space (and its wave motions) is the ultimate foundation for the causal connection of both physical reality and mathematical physics. It is commonly written by maths physicists that the correct language for describing reality is mathematics (which is hardly surprising given their devotion to the subject). Thus they tend to be dismissive of philosophy / metaphysics and the belief of the ancients (Aristotle in particular) that we could directly describe reality with everyday language and concepts. i) To keep the Wave Structure of Matter (WSM) in mind (thus matter is a spatially extended spherical standing wave structure of the universe, not a tiny particle). ii) And to question the source of the truth as to their claims (as you will see, they just state things, there is no proof, thus in reality it is merely opinion). The mistake was to assume that this limitation was inherent in our language, thus we could never directly describe reality and must limit ourselves to describing the 'pattern of events in mathematical terms'. We can now clearly understand how a 'particle' can exist 'everywhere at once'! as the 'particle' effect is formed at the wave center of Spherical Standing Wave the size of the observable universe. And this solution is really very obvious once considered! Thus the reason why we can have a pictorial representation of reality is because the wave nature of reality causes numerous wave phenomena (sound waves, waves on water, etc) all around us such that our minds have evolved a suitable language to describe reality. History shows that the particle-wave duality for both light and matter has puzzled and deceived our greatest thinkers over the past eighty years since its discovery. It has resulted in the seemingly strange paradox of Bohr's 'Copenhagen Doctrine' that the particle and the wave somehow 'complement' one another and represent a limitation in the ability of our human languages to describe reality. This led Physicists to accept the particle-wave duality and to believe that no further enquiry could be made into the true nature of reality. Effectively we have accepted a paradox of the particle / wave duality and assumed it must be true and therefore we cannot understand reality - and this has become a self fulfilling prophecy (thus physicists stopped looking for a physical description of reality). So there is a certain irony in the following quote from Feynman - as it is actually quite close to the truth. A spherical standing wave is like the many layers of an onion! Interestingly though, once we have a logical language which describes the mathematical relationship between objects, then we can do away with the objects and simply consider the exact logical (mathematical) relationships. Hence mathematics has a remarkable power which people did not understand, that further enhanced its mystical aspect. The skeptic will say: "It may well be true that this system of equations is reasonable from a logical standpoint. But this does not prove that it corresponds to nature." You are right, dear skeptic. Experience alone can decide on truth. ... Pure logical thinking cannot yield us any knowledge of the empirical world: all knowledge of reality starts from experience and ends in it. From this we can conclude that there are two types of mathematical truths. ii) Mathematical Truths which also correspond to Physical Reality. For an example of a simple mathematical truth only, let us consider the partial reflection of light by glass of varying thickness. If we assume that the light is either reflected by the front surface of the glass or the back surface of the glass, then by summing Feynman's probability arrows for both paths we can correctly calculate the probability of light reflecting from any thickness of glass. But you may rightly ask, what are 'surfaces', and how do they reflect light? This is a fundamental limitation of mathematics. It is quite possible to have a true mathematical relationship, that suggests a particular physical model, and yet the theory may be completely wrong. This makes mathematics very confusing and deceptive. I mention this because it is very important in explaining why mathematical physics is now so absurd as many of its mathematical truths have been misunderstood, which has resulted in incorrect theoretical interpretations (which is why a correct knowledge of physical reality is so important to mathematicians / mathematical physics). There are three very important errors currently in modern physics that relate to this confusion between empirical facts and theoretical interpretations. Light is empirically consistent with the idea of light as photon particles with discrete energy (the photoelectric effect). But the behavior of light is also consistent with the idea that light is a wave (interference, diffraction, two slit experiment). This has of course led to famous paradox of the particle / wave duality for light. So how can this inconsistent relationship between light waves and photon particles be true? The solution is simple once known. It is an empirical fact that light energy is discrete - it is an incorrect theoretical interpretation that light is a discrete particle. The correct theoretical interpretation is provided by the wave structure of matter, as resonant coupling only occurs at discrete frequencies, thus all light interactions are discrete. So we see that the 'photon particle' is equivalent to light reflecting of the surface of glass. They are both incorrect theoretical interpretations of empirical facts / physical truths. Thus we can now explain light’s dual nature in terms of a wave theory, while accepting the empirical truth of its particle nature / discrete energy exchange. In 1905 Albert Einstein published his theory on the photoelectric effect, and the idea of light as discrete bundles of energy (for which he received a Nobel prize in 1921). Einstein was a 26 year old mathematical physicist who was very clever at finding mathematical relationships that were consistent with experiment. He also published his theory of special relativity at this time. Therefore it is hardly surprising to find that this is also a mathematical relationship which is not physically true. In special relativity (non accelerating reference frames) it is assumed that the velocity of light is constant (principle of relativity). However, while it is an empirical fact that the velocity of light is always measured to be the same, it is a theoretical interpretation that the velocity of light is constant (a subtle but important difference). As the Wave Structure of Matter shows, the velocity of light actually changes, but the wavelength and thus dimension also changes which results in the velocity of light always being measured the same. You can see why this is mathematically true by considering the metric equations of special relativity (which is simply Pythagoras' Theorem applied to the three spatial co-ordinates, and equating them to the displacement of a ray of light). Special relativity is still based directly on an empirical law, that of the constancy of the velocity of light. dx2 + dy2 + dz2 =(cdt)2 where cdt is the distance traveled by light c in time dt. The fact that such a metric is called Euclidean is connected with the following. The postulation of such a metric in a three dimensional continuum is fully equivalent to the postulation of the axioms of Euclidean Geometry. The defining equation of the metric is then nothing but the Pythagorean theorem applied to the differentials of the co-ordinates. Because it is true mathematically that cdt = tdc then you can keep the velocity of light constant, and change the time as Einstein did, or you can keep time constant and change velocity of light as the wave structure of matter requires. Both will still be consistent with the empirical fact that we always measure the velocity of light to be the same. But only the wave structure of matter is physically true (the velocity of light does actually change!). It is an empirical fact that we observe a redshift with distance. However, it is a theoretical interpretation that the redshift is due to a Doppler shift / receding velocity, thus the universe is expanding. The physically true cause (correct theoretical interpretation) is that redshift with distance is due to decreasing wave interactions with distance. i.e. Space is infinite, but our 'observable' universe (as part of infinite space) is finite and spherical. Thus as two wave center 'particles' move further apart, there is less overlap of their respective observable spherical universes, thus less wave interactions / energy exchange, which must cause a redshift with distance. The universe is not expanding - there was no Big Bang. It is very simple. Cosmology - How our finite spherical observable universe exists within infinite eternal Space. 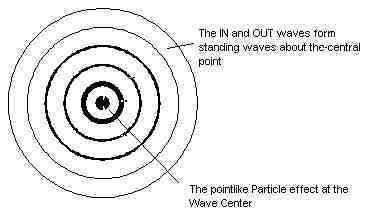 Effectively each wave center 'particle' is at the center of its observable universe, and its in waves are formed from this other matter's out waves (also see Huygens Principle). It is clear that this misunderstanding of the complex mix of mathematical truths and physical truths - empirical facts and theoretical interpretations is creating havoc in modern physics (and allowing all sorts of nonsense to be published). However, by understanding the physical truth of the wave structure of matter in space it becomes possible to separate mathematical truths from physical truths by having the correct theoretical foundations. This will obviously have great benefits in removing the conflict and confusion that currently causes such harm not only to mathematical physics, but to all the sciences (and ultimately our society).